Preheat the oven to 325 degrees. 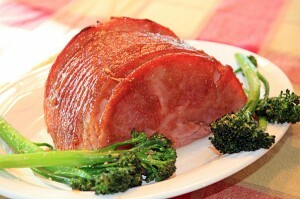 Put the ham, cut side down, in a roasting pan or large baking dish. Add 1 1/2 cups of water and cover with foil. Bake for 1 hour. With 20 minutes remaining, make the glaze by whisking all of the remaining ingredients together in a saucepan over medium-low heat. Allow the glaze to come to a low simmer and reduce heat to low. Remove the foil and brush the ham with the glaze. Make sure to get the glaze into all the little cracks around the spiral. Bake the ham, uncovered, another hour basting again every 15 minutes. Remove the ham from the oven when an internal temperature of 140 degrees is reached on an instant-read thermometer. Transfer the ham to a carving board and it let rest for 10 to 15 minutes. Baste it one last time. Pour the remaining glaze into a small dipping bowl. Thinly slice the ham and arrange it on a serving platter. Serve with the extra glaze on the side.